The 59.4 metre motor yacht Oasis, listed for sale by Y.CO, has been sold with Edmiston & Company introducing the buyer. Designed by Glade Johnson, Oasis was built in steel and aluminium by German yard Lürssen to Lloyds class and delivered in 2006 with a major refit in 2012. A popular charter yacht, she accommodates 12 guests in six cabins comprising a 99 square metre master suite, VIP suite, three doubles and a twin, all with plasma television screens, surround sound systems and en suite bathroom facilities. There is also accommodation for 15 crew in eight en suite cabins. A vast saloon has a comfortable seating area with a Steinway grand piano and an entertainment centre including a 60 inch plasma television screen and a Kaleidescape on-demand audio and video server. Forward is a formal dining room with seating for 12 guests. A highlight is the huge sun deck, offering a Jacuzzi spa tub, bar, barbecue grill, 120 inch outdoor cinema screen, dance floor and DJ desk. 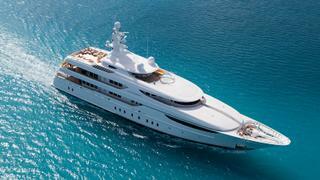 Twin 1,454kW Caterpillar diesel engines give her a range of 5,000 nautical miles at her cruising speed of 13 knots.